Tell me you all are enjoying the dinner recipes I’ve been putting on the blog this year! Today I’ve got another delicious, healthy option for you! It’s no secret that I love the spice, cumin. Seriously love it. I try it put it in as many dinners as possible. Today’s stuffed peppers are no exception! Normally I would make my mom’s version of stuffed peppers: green peppers stuffed with a mixture of ground beef, minute rice, tomato soup, salt, pepper and egg. Delicious? Yes. Healthy? um, no. I knew I wanted to do a healthy spin on my favorite dinner. We are trying real hard to eat healthier this New Year! When I saw the can of Classico crushed tomatoes at Walmart, I knew where I would go with this recipe. Mexican inspired! With cumin of course. I added jasmine rice to my healthier version. With 4 active kids they need some carbs in their meal. But if you’re watching your carbs, feel free to use less, or skip the rice all together (or try using quinoa)! I also added in some black beans and sweet corn to give these stuffed peppers more of that Santa Fe feel! The crushed tomatoes helped bring all the ingredients together. I was surprised at how fresh they tasted, even though it’s tomatoes from a can! Delicious! Did you know Classico Canned Tomatoes are 100% all natural, packed fresh with no added preservatives? This was a bad year for my garden’s tomato crop and I have relied on canned tomatoes this winter to make my favorite chili and spaghetti sauces. 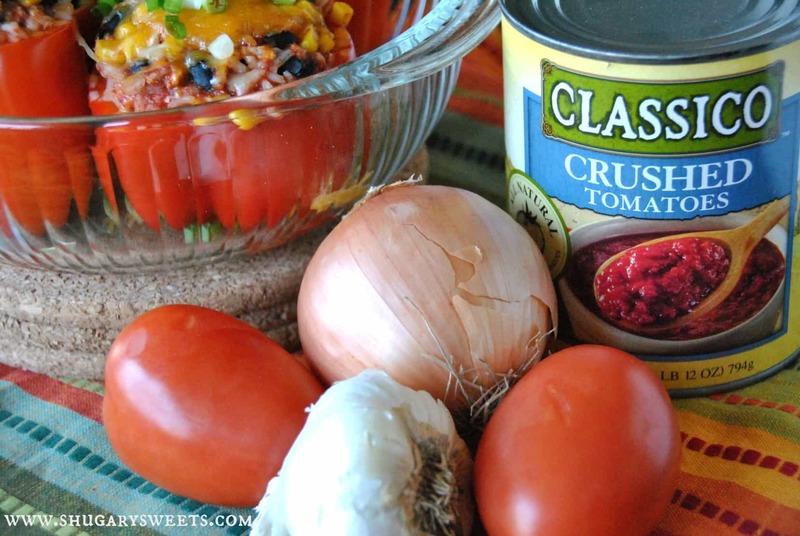 Classico canned tomatoes have come in handy by providing such a great tasting product. Especially since we use tomatoes at least once a week! 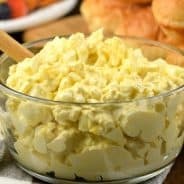 Classico’s website is filled with some other great recipes too! Give them a try! This recipe makes a large pan (8 peppers), perfect for company or a big family (like mine)! Feel free to make a smaller portion by cutting the recipe in half! ENJOY. 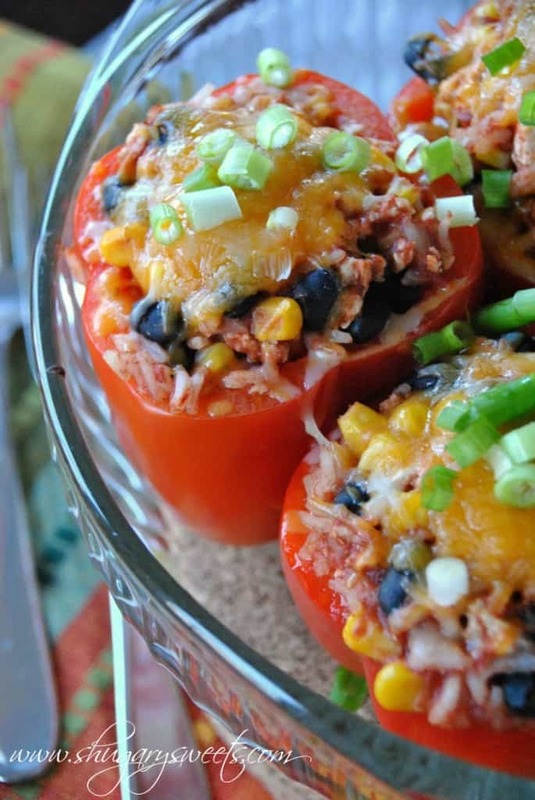 Delicious, healthy Santa Fe Stuffed Peppers recipe! Wash red peppers and slice the tops off each pepper. Remove the seeds. Stand each pepper up next to eachother in a large baking dish (13x9). In a large skillet, brown ground turkey until fully cooked. Drain. Return to skillet. Add cumin, salt, tomatoes, black bean and sweet corn. Simmer about 15 minutes. Meanwhile, cook Jasmine rice according to package. Add cooked rice to skillet, combining completely. Remove from heat. Fill each red pepper with turkey mixture.Cover dish with foil and bake in a 350 degree oven for about 40-45 minutes. Remove foil and to with cheese. Bake an additional 5 minutes, until cheese is melted. Remove from oven and sprinkle with green onion pieces. I love how stuffed these are! And great alterations from your mom’s version! I am most certainly enjoying the dinner recipes so far, Aimee. While I obviously have a huge sweet tooth – I need dinner too. 🙂 I haven’t made stuffed peppers in ages. The black beans and corn are a wonderful addition – “santa fey” salsa is my favorite kind, full of both beans and corn and peppers. I would love all of the chunks and textures in these! I’m glad you enjoy the dinner recipes Sally. Definitely not “shugary” but hopefully others find it helpful too! To see that we do sometimes eat healthy! Honestly, these are the BEST looking stuffed peppers! I am sooo going to make these, thank you! Awww thanks Michael Ann! They were not only pretty, but delicious too! These are some tasty looking peppers! I say, keep the dinner recipes coming!! Love red peppers and this stuffed version sounds fabulous. Yeah I like extra cheese too. Sadly my thighs do not! For one person? You may want to scale the recipe back, otherwise you will be eating stuffed peppers for weeks! Would you cut the bake time in half too? This is probably a duh question but want to make sure. these look SO good. they look healthy too cause you omit the carb part that is usually wrapped around the filling. love it! Thanks Julie, this is about as healthy as I get! haha!! I really, really love stuffed peppers! They are one of my go-to dinners. This post reminds me it’s been awhile. Now I know what I’m making next week! I go on droughts where I never know what to make, then I remember I have a whole reserve of favorites to draw from!! I have not had stuffed peppers in so long. These look fabulous! I am definitely adding these to our dinner menu! I had forgotten how much I love them. I even love them with a healthier twist! 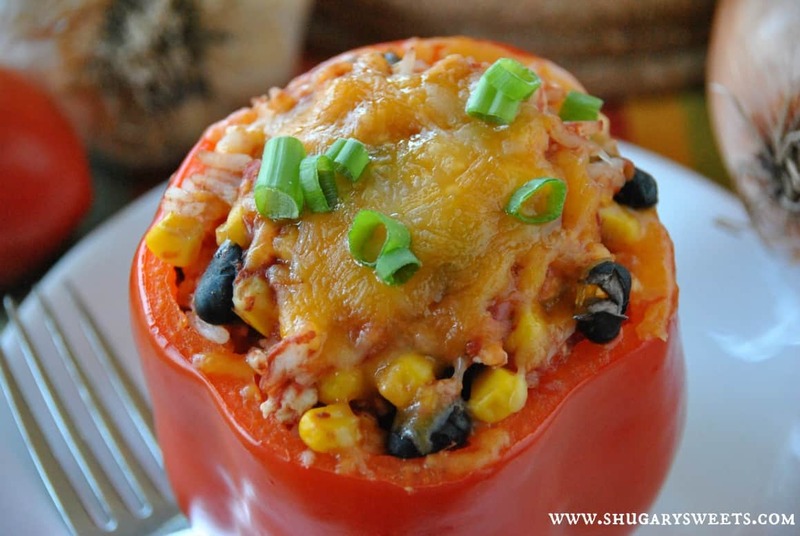 We love stuffed peppers…I love that you made these with the red peppers. Very striking! The funny thing is that I have a very similar recipe photographed and just sitting on my computer…maybe one day I will get around to sharing it. I just love how much we think alike with food!!! Of course you do! can’t wait to see your photos!!! Thanks Jess. I love the taste of red bell peppers so it was a perfect fit! My Mom used to make these when I was little. Time to make some for me! 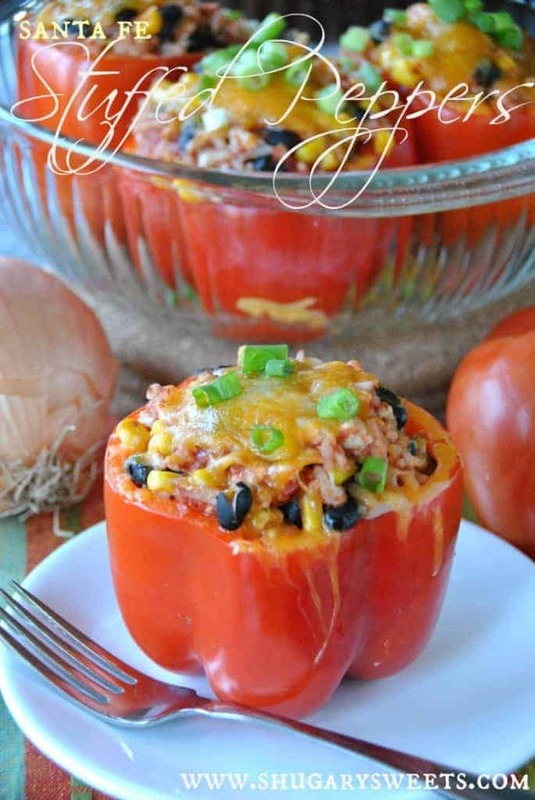 I love stuffed peppers and these look mouthwatering, Aimee! Mmmm! Aimee…these look outstanding! I am going to have to try making them! Thanks Tonia! They were quite delicious. And healthy too!! We love stuffed peppers! I love the addition of corn and black beans! Oooh! These look amazing! Pinned! I keep seeing stuffed peppers. These are definitely going on my to make list! I’m making stuffed peppers on my birthday dinner tomorrow 🙂 Yours look soooo delicious! These look so good. I’m am making them tonight. I have a question though. One of the pictures shows garlic and an onion, but the recipe doesn’t call for it. Do I leave it out or put it in? Thanks in advance. Haha! You caught me. I had meant to put some in, but didn’t (yet for some reason I still used it as a photo prop). Sorry for the confusion. It was delicious without garlic, but you could certainly add some in if you’d prefer! I had planned on adding 2 cloves, minced to the turkey as I browned it. ENJOY! I made these last night and they were simply DELICIOUS!!! I’m sure they will taste even better tonight…..Will be a staple for me!! Thanks for the great recipes, looking forward to trying more!!! Just saw this! So glad you enjoyed the recipe Gillian! Thanks for letting me know! how muh uncooked rice to make 3 cups cooked? It should say on your package of rice? Can I use frozen sweet corn instead of canned? Mmmm…. I’m making these for dinner tonight! Can’t wait to try them! Do you think I could make the stuffing part and freeze it and then whenever I want to make them just thaw that and stuff the peppers and bake? The real dilemma is I meant to cut the recipe in half but didn’t so I have lots of extra “mixture” left. Would it freeze okay? I think these look so good and healthy, I just sent my husband to buy the ing. to make them for dinner. I’m so glad you enjoyed the recipe Sydney! Your comment brought a smile to my face! I was about your age when my mom had me making dinners, and stuffed peppers were always a favorite in our house! Keep up the great work! These were quite delicious! I haven’t really enjoyed stuffed peppers before these! So glad you liked this recipe Melissa. We love stuffed peppers!!! Made these tonight and they were delicous! Will definitley be making these again! Made these last night and they were so delicious! 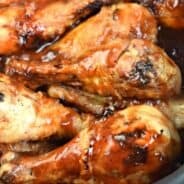 Thank you for sharing a great recipe! What is the recipie for two? I accidentally used 1.5 tsp cumin instead of 1.5 Tbsp! I only used 6 peppers so had a bunch of rice left over. Do you think I could add extra cumin to the already cooked rice? It made a big difference – too bland! You can try to add more seasoning to the cooked rice. Add it before stuffing more peppers! You may also want more salt and pepper if using day old filling, tends to lose it’s flavor with the cooked rice in there! If I were to use ground beef, should I use cumin or another spice?? Just swap out the ground turkey and use the beef. No other substitutions needed. So I just made these, waiting for them to come out of the oven! Here’s the kicker, I only needed to make 2 peppers so I have TONS of stuffing left over! Can I freeze it and reuse it later? How long will it last in the freezer? Hi I was wondering about how many calories one stuffed pepper has? Is that 3 cups of rice measured before or after cooking? 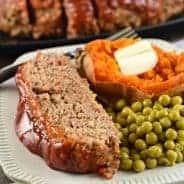 can you substitute ground beef instead of turkey meat? Just made these for company and they loved them! Made just as the recipe said. Thank you! Thanks Leslie for stopping back over and leaving a comment. I’m so glad the recipe was loved and enjoyed by many!! 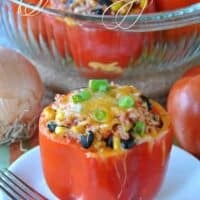 Pingback: Friday Night Fun : Stuffed Bell Peppers and Spicy Chicken | Healthy Hungry Student : Tips and Recipes! I made these tonight for dinner, and they were a huge hit! To give them more of a Mexican taste, I added some chili powder (I also added some fresh minced garlic). What a hearty meal!! We normally don’t use ground turkey, as my kids aren’t fans of it, but honestly, no one could tell the difference. how do you think this recipe would be with quinoa instead of rice? I have made these peppers a bunch of times. I just love how they turn out. So much flavor with the red peppers. In my opinion, these are better than the traditional stuffed green peppers. Great recipe!